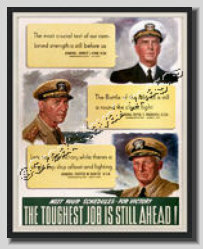 This reproduction depicts a great looking WWII vintage Navy recruiting poster. It States: The most crucial test of our combined strength is still before us (Admiral Ernest King). The battle of the <?xml:namespace prefix = st1 ns = "urn:schemas-microsoft-com:office:smarttags" />Atlantic is still a round the clock fight (Admiral Royal Engersoll). Let's not talk victory while there's a single Jap ship afloat and fighting(Admiral Chester Nimitz). Helped promote PRIDE and HONOR in our military and country.